Kopa. . HD Wallpaper and background images in the Le Roi Lion club tagged: disney the lion king. I think kopa is a fan-fiction but it's only 50% i think and 50% real. Kopa is older than kiara but this pic is the cutest ever ::)!!!!!!!!!!!!!!!!!!!!!!!!! Kopa is real and he is OLDER than Kiara.And he marrys Vitani. Kopa and Kiara do not exist in each others' stories/universes. But if wanted to combine, just because he was created before Kiara, does not force him to be older. Exactly because the movies and books do not connect in any way which makes it possible to imagine them timeline-wise whatever way desired. Except that the only way to have it make sense at all would be to imagine Kopa be born after the sequel film's events as in when Kiara is already a teenager. Because any other way he would cause tons of plot holes and illogicnesses - for he was not intented into the sequel film's story as in he has no place in its timeline. But this is a very cute little fan art nonetheless. that cub that is looking at kopa could be boga.#1 birth boga lay beside her mother, watching nala.she could hear nala's soft voice and steady breathing. nala was lieing quietly on her side with her eyes closed.it is time for her cub to be born.soon there is a sleepy cub by her side.boga walks over shyly. she put her paws on nala's paw and lie down.every body watches nala's second child, kopa. 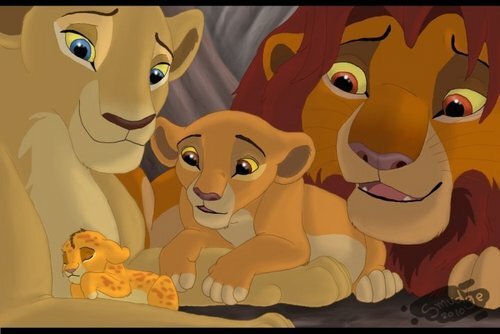 That cub should be Kion. Now that Kiara is having a little brother in a new film/tv series, The Lion Guard. That cub would make it Kion rather than Kopa. Kopa is just from the books.